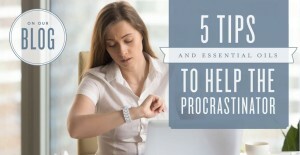 Want to learn how to not procrastinate? The best place to start is by trying something new! Personalize these tips and hacks so they work for your lifestyle; you’ll become more productive, and you’ll be able to set goals and accomplish them. Check out our tips for beating some of the most common procrastinating pitfalls and try adding a new one to your life today! Mustering the energy to work out early in the morning or after a long day can be difficult when comfy beds or your favorite TV show are calling. Fight the temptation to put off gym time by starting small! Spend just 20 minutes working out before rewarding yourself with TV time. Better yet, watch it while riding a stationary bike or while walking on the treadmill! Small, consistent workouts are better than a big workout once a week! YL Tip: Mix Peppermint or R.C.™ with a carrier oil and apply topically for a motivating aroma before you head to the gym. As part of your post-workout routine, apply Cool Azul® Pain Relief Cream to soothe minor aches and pains in your muscles and joints! Making a plan can feel like a daunting task, especially when you have a few tasks you’d rather just ignore. Writing down what you need to tackle makes you more accountable and organizes your schedule. Plus, it feels good to see a list of check marks when you’ve gotten some things done! Get started by taking just five minutes every night to create a to-do list for the next day. Put the important or overwhelming items at the top of the list, so you can finish them first and skip all-day stressing. Remember: Break up large tasks into manageable to-do items. You can’t do everything all at once, so there’s no use worrying about it! YL Tip: Diffuse a favorite essential oil—we like Motivation™, Brain Power™, Inspiration™, or any citrus oil—for an empowering aroma to get those pesky tasks written down and checked off! Getting ready for bed sometimes feels like the most tedious task, even though all you want to do is hit the hay. Instead of putting off your nighttime routine while you endlessly scroll on your phone, get yourself prepped for a great night’s sleep. You’ll thank yourself later, since being well rested will help you stay productive in other aspects of life. Check out our blog post The Snooze Routine: Tips for a Better Night’s Sleep for tips and tricks—like a steamy shower or a relaxing linen spray—to help you avoid late-night procrastination. YL Tip: Diffuse Lavender to create a relaxing atmosphere before bedtime. You can even turn off your room’s main lights and let the light of your diffuser help you adjust to a relaxing mindset. It’s not often you meet someone who loves cleaning the bathroom, doing the dishes, dusting the furniture, sweeping or vacuuming the floor, or any other mundane household chore. Most of us simply have to put on our rubber gloves and get to work—which means the chores are often put off for other more appealing options. Make it easier to take on tricky tasks by adding a little fun. Blast a new playlist, see how much you can clean in just 10 minutes, or listen to a podcast—like Young Living’s Drop of Inspiration—or an audiobook! YL Tip: Use Thieves® Household Cleaner and let the refreshing, clean scent liven up your mood as you take on the chores. Even if you enjoy a casual night of cooking, sometimes prepping and cooking a whole meal after a long day is the last thing you want to do. Cut down your cooking time with Vitality™ essential oils! Instead of spending time chopping herbs or zesting citrus, use a drop of Thyme Vitality™, Lemon Vitality™, Basil Vitality™, or whatever you need! Vitality also makes it easy to experiment with new flavors to bring a new spin your favorite recipes. YL Tip: Add Oregano Vitality™ to your pasta sauce or Lemon Vitality to your marinade to turn your dinner from simple to gourmet in a few drops! Looking for more ways to add essential oils to your daily life? See our posts 7 Essential Oils Happy People Use and Essential Oils for Homesickness for more ideas!